My family has been a fan of Krakus products for a while now - the local supermarkets have been carrying their canned products for at least a few years now to cater to our growing Eastern European community, and local delis have sold imported Krakus ham for as long as I can remember - and so far, we haven't been disappointed. 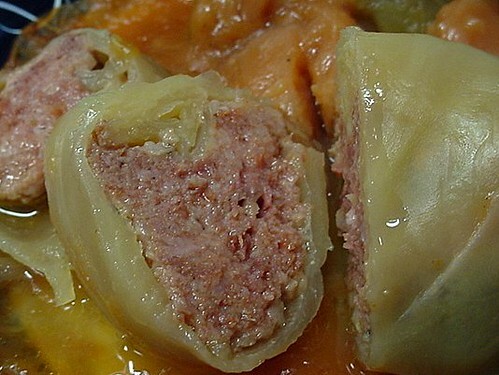 The other day, with hot dogs scheduled for supper, I was looking for something that would be along the lines of sauerkraut to serve with them, but at the same time, different. Vegetatble Salad "No. 4." caught my eye and seemed to fit the bill. It was no easy choice, actually. Krakus puts up quite an extensive line of Vegetable Salads, each of them different than the next. "No. 4" has cabbage, pickled cucumbers, onion, and shredded carrot in a brine well-balanced between tangy vinegar and mildly sweet sugar. 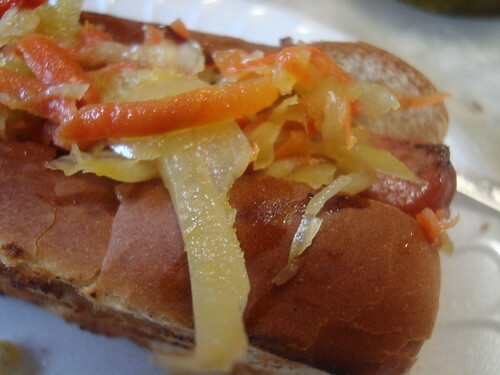 I piled a bunch of it on top of my hot dog and liked it better than sauerkraut. Quite tasty. 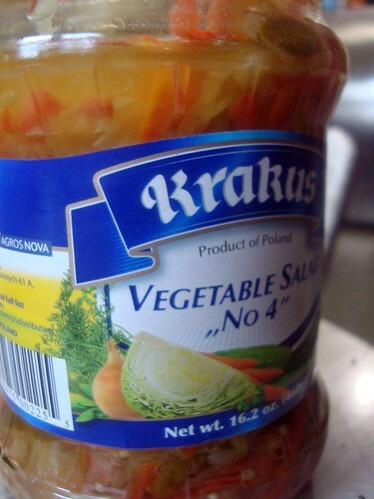 Strangely enough, Krakus' website doesn't mention any of their vegetable salads, concentrating instead upon the product which is the most famous in the American marketplace, their excellent hams. Too bad, because I think Americans could develop a taste for the salads if they were given a chance and slapped in the eyeballs with a few advertisements. 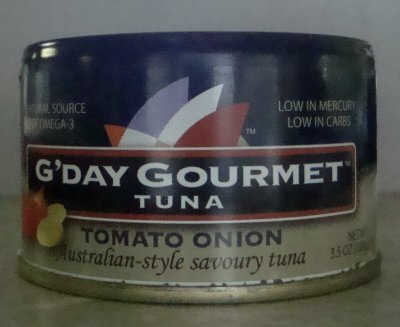 While shopping at Ocean State Job Lot, Dave and I stumbled upon these cans of "Australian style tuna" called G'Day Gourmet. The shape of the cans amused me - they have the same upside-down can layout that cat food brand Fancy Feast does - so it immediately led to cat food jokes while we walked through the store. 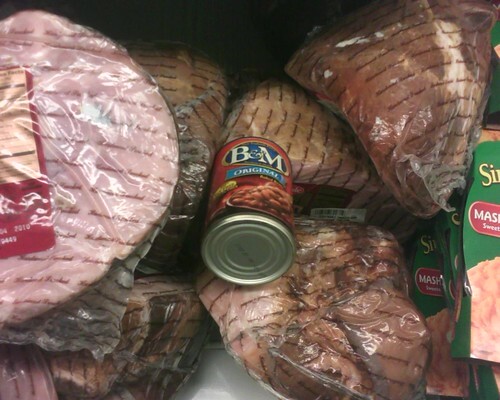 At a buck a can, they looked to be a sufficient lunch size, so I decided I'd give them a go. When I opened the can up, the first thing I noticed was that it had decent sized chunks of onions throughout the tuna. It also had small, pale pieces of tomato swimming on top. And mixed within the tuna was a strange, sweet-tasting watery stuff. The Fancy Fea-- I mean tuna -- tasted like it was swimming in cheap barbecue sauce. The tomatoes and onions were accented with vinegar and that annoying something sweet was probably covered under the "natrual flavors." 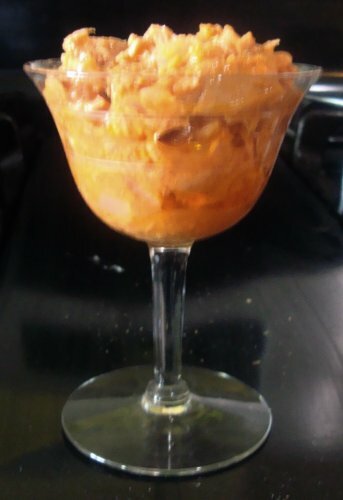 Unfortunately, a lot of the tuna's flavor was drowned out with the sweet-vinegary-tomatoey flavors going on. I can definitely see why this flavor was in a job lot. 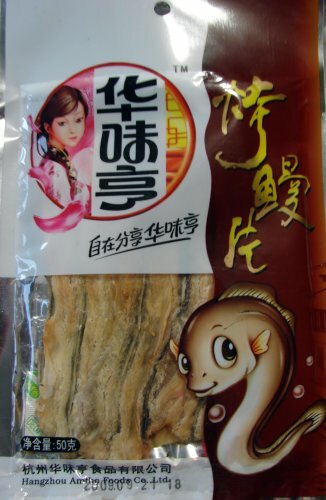 So I've had this package of fishy snacks lurking in my kitchen for a few months now; my altdaughter Stephanie (who is teaching in China and writes the blog Stephanie In Shanghai about her experiences) sent it to me in a sort of "CARE package" of Asian goodies. I've kind of been avoiding opening it, because they're...um...eels, and eels totally squick me out. But curiosity is a stronger primal force than squick, and so it was that I finally opened up the package to give them a try. 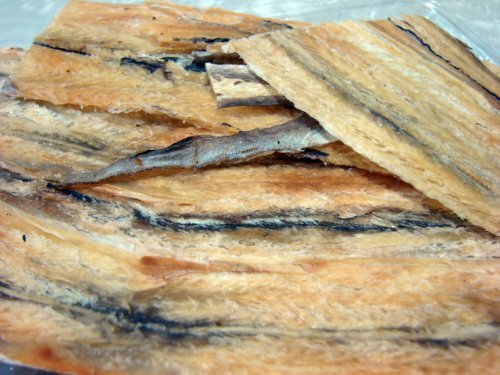 I've had lots of dried fish products, most of them pretty good. I've tasted dried salt cod right off the sun-bathed racks of a New England fishing dock. I've eaten shredded dried fish, and clam jerky, and leathery strips of dehydrated squid. But none of it - not a bit - was as agressively fishy as this dried eel. The taste is strong and deeply fishy, and not in a pleasant way. And it stinks, as well. Imagine an old fish fillet, forgotten in the back of the fridge for a week or two, and then discovered. That first whiff? That's what the eel was like. I ate a piece, and the flavor just gets stronger and more off-putting the longer it's chewed and held in the mouth. It was truly Not Good. And yet, for all that, dried eels snacks do have their uses. I don't know where the dog was when I first opened the pouch - he certainly wasn't in the kitchen with me. But within seconds, he was at my side, nose lifted, sniffing deeply in the direction of the pouch and looking at me with those big liquid I Love You Because You Have Snacks eyes. Luckily for him, eel snacks are high-protein and low-fat, and so I indulge his craving now and then with them. I'm glad someone in the house can stand them. Since picking up the task of reviewing Healthy Frozen Meals, I've learned a few things. There are some meals that are better than others, there are some brands that are better than others, and there are some things that just don't lend themselves well to being frozen and put into a "healthy" form. (Dave's look at frozen lasagna proves that.) Over time, 've come to expect a lot from the Healthy Choice meals that I try. The brand is usually pretty good. 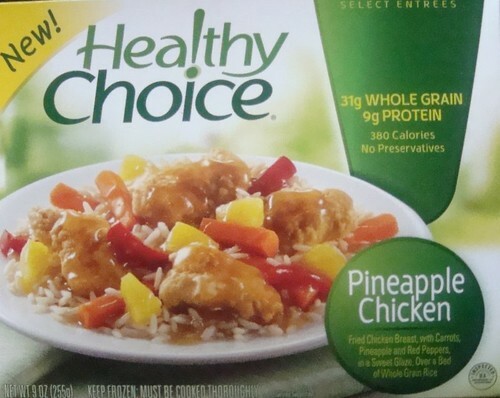 And then there's Healthy Choice Pineapple Chicken. 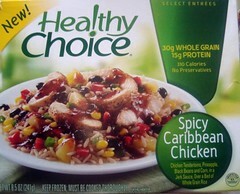 This was one of my least favorite Healthy Choice meals to date, and it's very much due to the chicken and the sauce. As usual, the rice and veggies are done to perfection: slightly crisp red bell peppers that overflow with flavor, carrots that are done so that they don't turn to mush, and rice that's not tough or mushy, but just right. The pineapple is fairly standard processed pineapple chunks, so I don't really have an opinion there. But the chicken is just like those chicken tenders that you get at the Chinese fast food place up the street - you know, the ones where it's mostly batter and just the slightest hint of chicken within? Think of those with none of the grease, but all of the cardboardy flavor of the Chinese fast food kind, and that's what you get in this Healthy Choice meal. And the sauce is the worst part yet. The package said that it was in a "sweet" sauce, and boy, that box wasn't kidding. Sweet notes - honey, pineapple juice, sugar - overpower everything in this meal. The ingredients say that there's supposed to be ginger in here, but I can't taste it over the syrupy sweetness of the sauce. In fact, I couldn't taste the veggies over the sauce, either. This was some seriously sickeningly sweet stuff. In any extensive product line, there are bound to be items that fail to appeal. This is not a meal that I'd ever contemplate buying again. It was a real shocker for me: until now, I'd only ever had one Healthy Choice meal that I didn't like (that review will be up within the week.) But this was just too overpoweringly sweet for my tastes. Perhaps if the sauce is toned down quite a few notches, I'll consider getting it again, but not before that. If you've got a strong sweet tooth, though, you might give it a try. My hometown has a brand-new barbecue take-out place. It's called Backyard BBQ, and it's at the intersection of Brainard and Washington Roads in the north end of town, close to the state line. I drive by that storefront every day on my way to work, and because there's been some activity there in recent weeks, I was keeping an eye on the site. Glad I did, too, because they opened their doors Sunday. 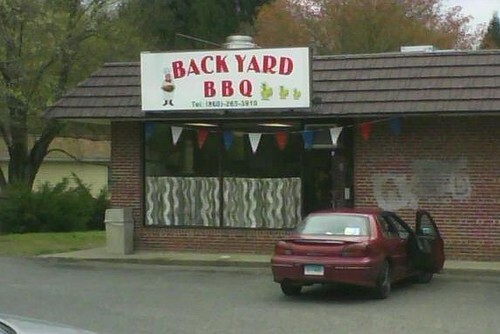 Backyard BBQ is take-out only - the store is on the small side and most of it is kitchen, with a service area up front. They have an amazingly delicious-looking selection of pastries on one side of the store, and a mouth-watering hot food service on the other side. 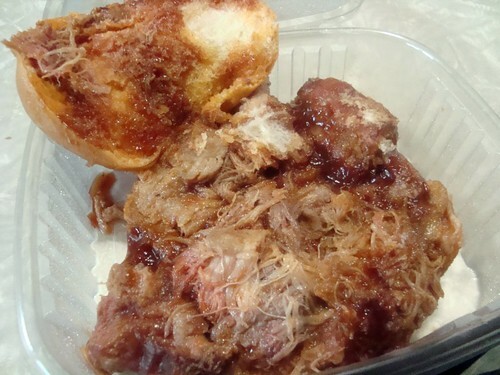 The mains include Half BBQ Chicken, BBQ spare ribs, pulled pork, and Angus beef sliders. (a limited menu, perhaps, but I'm sure they're keeping it simple for the nature of the place and to see how well it takes off.) For this first visit, I chose to keep it simple and order something that I knew would give me a good indication of their quality - a pulled pork sandwich. In short, I was favorably impressed with Backyard BBQ, and I'll be going back to try some more of their offerings - this Friday, for example, I plan to pick up some chicken and ribs for supper. I also saw some really good-looking Greek spinach pie in the display case. Might have to get some of that as well. These are showing up here and there in Dollar Trees, long after the Transformer movies are blessedly fading memories: Special-edition Transformer M&Ms. They're strawberry flavored, with a peanut butter center, surrounded by a layer of chocolate, coated with the trademark M-labeled candy shell. Perhaps surprisingly, they taste pretty good, if somewhat different from what we've come to expect of M&Ms. Y'know, if I hadn't seen these in the dollar store, I would never have even known they existed. When the Transformers movie was in theaters last summer, I don't remember any advertisements for special M&Ms. 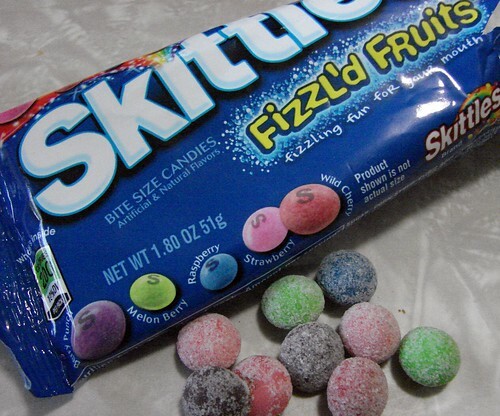 And I certainly don't remember seeing them in any of the usual retail candy outlets around here. It makes me wonder if the candies had as brief a flash in the pan as the movie did. And it makes me wonder why big companies like Mars really find it worth the time and cash it takes to retool a manufacturing line to make a tie-in product for something with such a short sales window. Just sort of makes me shake my head. 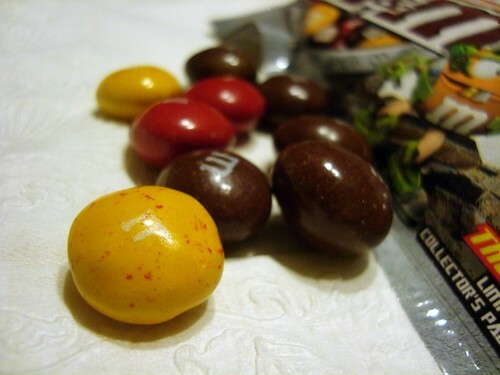 This, by the way, is a cross section of the Transformers M&M. It's kind of rough-edged because Lynnafred and I didn't even attempt to surgically split one with a scalpel or anything - she just bit one in half. 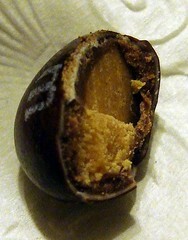 Anyway, the peanut butter center is clearly visible, as is the chocolate surround and the candy shell. Careful nibbling revealed that the strawberry flavoring is found in the candy shell, probably in that first "primer" coat - the white layer between the chocolate and the colored shell. I hope you all appreciate the delicate and painstaking methodology we used to discover this flavoring secret. I love going on road trips. I like to get out of New England every now and then - even if it's just a trip to New York City - and get out and see things and do things. But flying freaks me out, and trains are expensive and kind of limited as to where I can go as far as I'm concerned. So travel by car it is then. And traveling by car has its perks. There are things you can see and do that you just can't when you're on a plane or train. Granted, you'll get to your destination faster in your plane or train than I will in my car, but I'll get the enjoyment of treating myself to stopping at midnight for gas, driving into sketchy rest stops at three in the morning, and trying strange local snacks from vending machines when I get hungry. And that's exactly what my friend and I did over the course of our Spring Break. We were able to take a week's worth of clothes, two bags of road food, and a forty pound crate of soda and cram them into my tiny little Smart car. Wait - what? Vienna sausages? My friend and I did a double take and - yes, there on the bottom shelf for a whopping $1.25 - Armour brand Vienna sausages, packed between some cookies and cinnamon rolls. Thinking it too strange to not take a picture of, we snapped some photos, I called Dave from the parking lot to share the joy of my discovery, and then we went on our merry way. A few days later, we were shopping at a Publix when, in the prepared foods section, I came across six packs of pre-peeled, hard-boiled eggs. I pulled my friend over and we laughed at that, too. 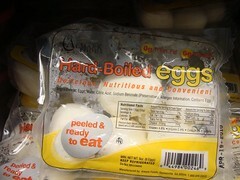 I had never seen pre-cooked hard boiled eggs before. On top of that, neither of us were brave enough to get one of them to taste. They looked a little...brown. And oozy. So, after taking more pictures (and calling Dave again) we went the safe route and get some store-made sandwiches before getting back to the road. Finally, on the way home, we stopped at a rest stop in Pennsylvania. There, I saw some potato chips for a buck. I was hungry and overtired, and just needed something to hold me over for the next five hours until I could flop onto my couch and call it a day. And these were some very strange chips - they're cooked in vegetable shortening instead of regular oil. 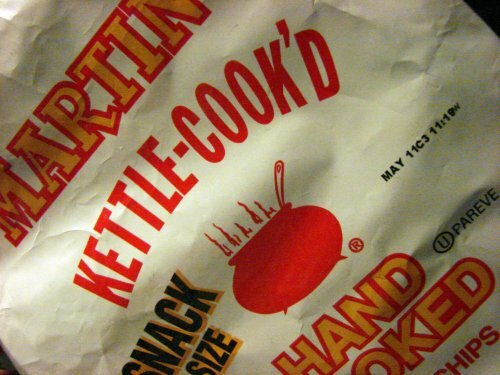 Martin's "Kettle-Cook'd" potato chips are certainly worthy of my 'strange road food' classification. They're probably the best chips I've ever had, with a rich, full-bodied potato flavor and an amazing crunch. And yet, they were also extremely heavy-tasting because they're cooked in shortening instead of oil. They felt like they should have left a grease film in my mouth, but when I checked the Nutritional Facts on the back, the first thing I noticed was that they have the same amount of calories as regular chips. One one and a half ounce bag of these chips had 220 calories, and 110 of them are from fat. They just tasted like they should have had a lot more calories than they really did. There were a lot of other things that we wanted to eat while we were on the road, but just didn't have the time for, like the temptingly-named but oh-so-shady-looking Waffle House; Chick-Fil-A, which I've heard so much about but have never tried; and so many strange snack foods and other fast food chains - but they'll have to wait for another time. But I won't hesitate to take another road trip, especially if it means that I'll get to see more bizarre foods in unlikely places. 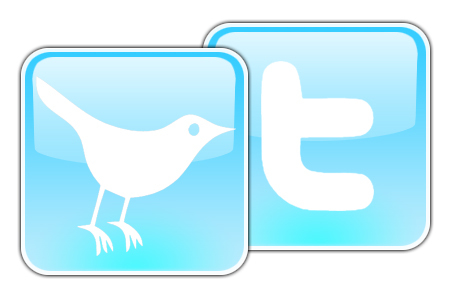 How Businesses Can Be Better Tweeters. This post isn't really food-related, but it needs to be said. Like it or not, Twitter is a big part of the internet landscape right now. It's a great tool for microchats with friends and associates, and businesses have found that it is equally effective for communication with existing and potential customers. Although I don't send out that many tweets myself, I get endless enjoyment out of following a bunch of friends and fellow bloggers. And, most relevant to this post, I follow a few businesses as well. As a consumer, I find commercial tweets to be informative. They let me know about line introductions, brand extentions, new products, and special promotions. As a blogger, I read commercial tweets as mini-press releases which tip me off to upcoming company news or interesting chatter I can pass along to my readers. Most of it is good stuff. But some of it is stupid, repetitive, utter crap, and businesses need to learn how to quit shitting into the tweet stream lest they start losing followers. Do keep a fairly active twitter stream. Stay in the timeline and you'll hold our attention. Don't keep tweeting the same damn thing over and over. If I have to see "Taste our delicious new line of powdered soups!!" six times a day, guess what I'm NOT going to buy? Your annoying soups, that's what. Don't treat Twitter like a free advertising conduit. There's a reason it's called "social media." People are following you because they already know your company and like your products. Do tell us about new stuff, or promotions, or interesting company news. Don't dun us with advertisements unless you want us to unfollow you or actively block you. Don't assume that all we want from you is tweets about stuff you're selling us. Do give us links to interesting news relevant to your business - or links completely irrelevant to your business that you just think would be cool to share. Do feel free to RT compliments and comments followers send to you - we like recognition as much as you do. Do treat your followers as partners in your success. We follow you because we beleive in you and want to see you succeed, and because Twitter gives us a more intimate and immediate connection with you than we can get through traditional means. There you have it. Please, marketers: take these suggestions to heart. 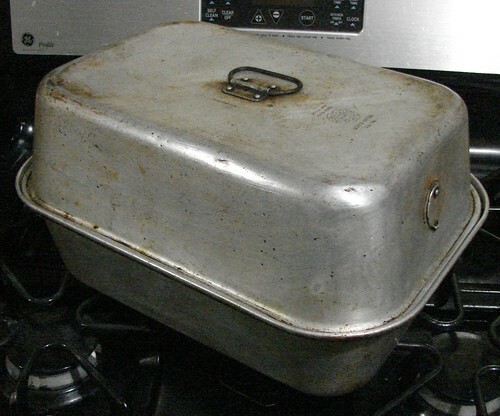 Ladies and gentlement, I present to you perhaps the best covered roaster ever sold: The Wearever Aluminum No. 325, originally sold in the 1940's. The one in the picture above is my own, and you can probably tell by the assorted little dings and patina that it sees a lot of use. Its big rectangular footprint is awesome. The bottom surface of the roaster measures about 9 by 14 inches, and the bottom pan is 5 inches deep, with a matching 5-inch-tall lid -and because it's a rectangle instead of on oval, it's easy to scrape along with the square blade of a spatula. So, what can you do with such a big roaster? A pair of chickens or a full turkey is the obvious answer, but this pan gets a lot more use than just poultry duty. It can hold a full corned beef brisket along with veggies and liquid for oven braising. You can use the bottom and the lid, side by side, each holding more than a double batch of homemade Chex Mix, so instead of doing four standard batches for all those holdiay parties, you can do one big quad batch all at once. It's great for pre-cooking lasagne noodles - you can lay the noodles down full-length and flat (can't do that in a stock pot.) The pan will easily bridge the front and back burners on my range, so I can quickly make huge quantities of gravy for big family dinners. And, of course, you can always use a big roaster for small jobs as well. The best part about the pan, though, is the affordability. I paid 50 cents for mine at a church rummage sale many years ago, but they were produced in huge quantities, and I still see them at tag sales and rummage sales for a dollar or less, and at flea markets for less than $5. Many standard roasting racks will fit comfortably within these pans, but if you can, make sure you get the original 3-piece set consisting of the roasting pan, lid, and aluminum rack (very sturdy and made of sheet aluminum.) Once you find one and use it, you'll wonder how you ever got along without one. So you may well ask, in light of my long experience with top-notch golabki, why I would bother buying them premade, in a can. Why indeed. Because they were on the supermarket shelf. They came out of the can in an unrecognizable solid mass, encapsulated in a can-shaped block of aspic-like, pale grayish-red tomato sauce. 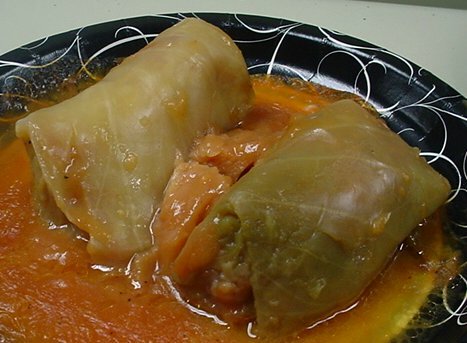 I poked cautiously at the mass with my fork and eventually the sauce fell away, revealing two rather generous stuffed cabbage rolls. I arranged them on a plate and distributed chunks of the gelatinous sauce on and around them before popping them into the microwave for a three-minute zap. As the golabki warmed up, they started to smell pretty good. Once out of the oven, they looked remarkably like homemade (although just a bit smaller.) The sauce hadn’t improved much in looks, but it smelled and tasted pretty good – there was a rich porkiness to the sauce that made it taste almost like a tomatoey pork gravy (though it was a bit on the bland side and was improved with the addition of black pepper.) The cabbage was tender but not mushy and enclosed a rich pork filling that was curiously bright pink like corned beef (thank you, sodium nitrite!) The filling was finely ground and had a bit of filler in it, but the texture was pretty good and not too soft, and the flavor was porky and pleasant. They are not as good as homemade, but I liked them for what they are. Lynnafred tasted one and said they were good enough for the apocalypse shelter, but she wouldn’t want to eat them if she wasn’t hunkered down with a shotgun and a machete waiting for zombies to attack. A couple weeks ago, I wrote about Ocean Queen canned smoked scallops. I thought at the time that they'd be a great ingredient on a seafood pizza (specifically, a bacon/scallop/anchovy/clam pizza.) So I made one. 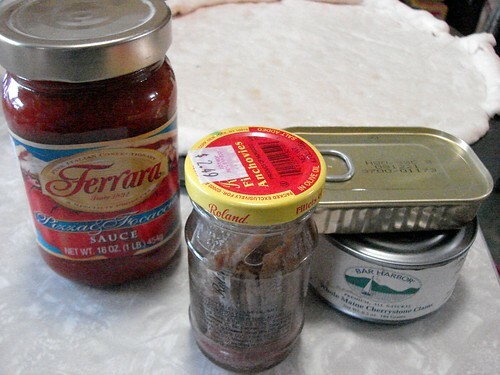 I made a standard batch of pizza dough and set it aside to rise (it's in the background in the picture at left) and assembled the other ingredients: Ferrara pizza sauce (a snappy and well-seasoned tomato sauce,) a jar of anchovy fillets in olive oil, a can of Ocean Queen smoked scallops, and a can of Bar Harbor Foods littleneck clams. After the crust had risen for about an hour, I spread it with the sauce and sprinkled it with little chunks of fresh basket cheese and a light scattering of mozzarella. Then I topped it with pieces of cooked (but not crispy) bacon, a few anchovies arranged like spokes radiating from the center of the pie, and the scallops and clams, properly distributed. 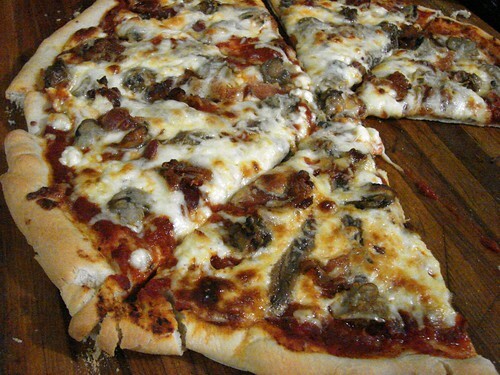 A heavier scattering of mozzarella followed, and it was into the oven for about 15 minutes at 500 F. The high temperature is essential for a decent crust, and also makes the bacon crispy and gives the cheese a light golden brown finish - just the degree of doneness I love on a pizza. Now, I know that it's pretty much traditional for food bloggers to present their creations and then write about how amazing and awesome and delicious everything was, but I have to admit to being a little disappointed with the results. Theoretically, this pizza should have been THE MIGHTY SEAFOOD PIZZA - all the flavors were complimentary to one another, the crust came out great, and Ferrrara sauce can hold its own against most pizzeria sauces. This should have been a home run. But truth be told, it just wasn't. The seafood flavors were far too overwhelming; next time I get a craving for this kind of pizza, I'll leave out either the scallops or the clams - I'm almost certain it was one or the other that pushed the final result over the edge. 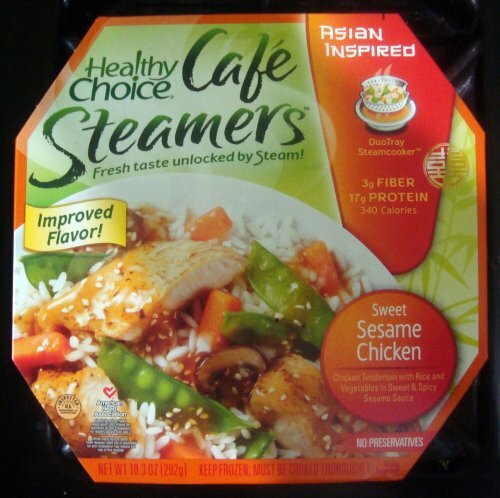 Costco had a great deal on Healthy Choice Cafe Steamers last time I was there. They were a four pack for something like seven bucks, and there was a coupon for three dollars off one of these four packs. Awesome deal. 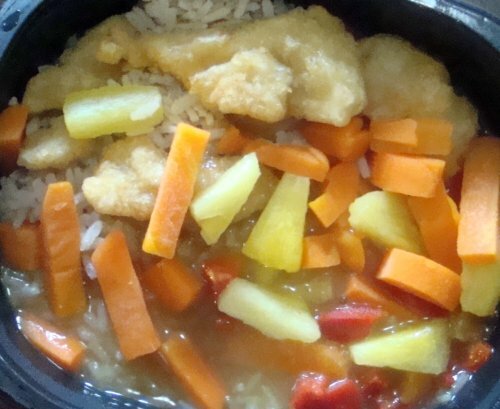 So the four packs had one flavor I've reviewed before (twice, even) - Orange Zest Chicken. The other three flavors are Margarita Chicken, Chicken Marinara, and today's entry, Sesame Chicken. And...oh, are those mushrooms? Gross. Well, first observation is that there are mushrooms in the sauce. (I've always hated mushrooms; they have one of the most disgusting textures to me. But I love the flavor they add to food.) So I'll be picking around the mushrooms. But everything tastes pretty good: the peas are what I've come to expect from Healthy Choice - cooked so that they're still crunchy but not soft and falling apart, the carrots are slightly crunchy and enjoyable, and the rice is perfectly done and - get this - actually sticky. Yes, Healthy Choice has done a miracle in the frozen food world: they have bestowed upon me sticky white rice to go with my Asian-inspired meal. Aces! The chicken is done perfectly as well, but it tastes kind of like it's been in a lemon juice base. It's got a tang if you taste it carefully, but if you're cutting it up and eating it with everything else you probably won't notice it. Oh, remember what I said earlier about picking around the mushrooms? No such luck. The mushrooms are pretty well chopped, so it's hard to navigate around them. So other than the kind of rubbery, plasticy texture of the mushrooms, this meal rocks. So what about the sauce? It's thick - like, really thick, almost to a syurp stage - and it's got little sesame seeds in it, but they don't really lend that sesame flavor to everything. You can smell it when it cooks, sure, but other than that, there's so much more going on in this meal that you can't really taste the sesame note alone. And the sauce is very heavy on the sweet, and kind of lax on the spicy. And it tastes like mushrooms, but that shouldn't be a shocker - there's mushrooms throughout the entire thing. So this meal is pretty good, overall. The veggies done well, and the rice was nothing short of amazing. (sticky rice that's been frozen?! Woah, cool!) The sauce was the letdown here, and it wasn't sue to flavor - it was definitely due to thickness. So, I'm going to minimize my cooking time next time I make it to see if that helps loosen the sauce up a bit. This was a tough year for my capicola. I got a bit of a late start this year, which usually isn't a problem, but going into March, the temperature came up unseasonably warm and conditions in the attic where I cure the cappy got a little iffy. I kept an eye on the temp up there, and when it started breaking 60 F it had me a little worried. As it turned out, daytime temps started hitting the high 80's and even topped 90 F for a couple days, and that short run was bracketed by several days in the upper 70's. Worse yet, nighttime temps didn't drop low enough, or fast enough, to moderate the temperature in the attic. Everything hanging there had to get to the spare refrigerator. for the last couple of weeks of curing. I suspected we might have been too late for at least one of the capicola - when I brought them down from the attic, I noticed a single patch of mold on one of them - a fairly standard green mold, which woujld have been harmless, but with small spotty bits of what looked like a black mold mixed in, especially infiltrating the netting on the outside. 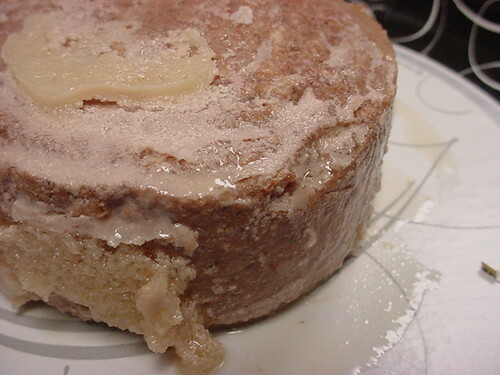 It worried me, but wince there was just a few weeks left to the aging, I decided to take a chance and try to save it. I scrubbed the moldy section with a stiff-bristled brush and plenty of white wine, then patted the meat dry and stashed it in the fridge to finish curing. I checked the capicola daily, giving it a squeeze now and then to test for firmness, waiting for that magical "just right" point where the meat isn't squishy and isn't hard, but just firm enough to resist the squeeze and just soft enough to have a bit of yield when pressed. That point finally arrived for most of the cappies a few days ago, so I took them out for the unwrapping. All of the hot capicola came out perfect. The meat was firm and just a bit moist; the outside surfaces under the casing were dry and well-crusted with their pepper coating. There were no spots of mold on any of the hots, And the flavor was just was as good as the appearance: slightly smoky thanks to the chipotle powder, with a good but subtle burn from the chipotles and cayenne pepper - not really enough to cause any rebellion in the mouth (just a hint of fire, really) with a bold hot finish that builds as you enjoy a few slices, but never gets overwhelming or too powerful. 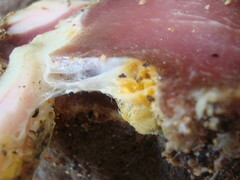 A closeup of the green and white molds growing on the meat. yellow and orange molds found here. Two of the sweet capicola, however, were troubling. The one I mentioned earlier had regrown some of the mold on the exterior in the same place where I had scrubbed it previously. When the casing came off, I found out why: There was an extensive green mold colony under the casing, extending down into a crease in the meat. 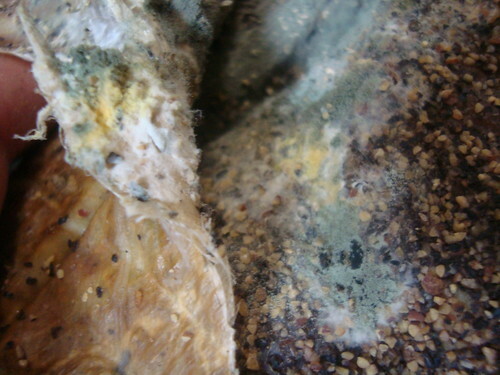 This was not necessarily a problem, since green and white mold are harmless and in some ways even desireable. But when I peeled back the shallow meat flap that was covering the crease, I was dismayed to find bright orange mold growing in the center of the moldy patch. Squeezing the cappy gently caused some liquified fat close to the meat to ooze out, and that was orange-red as well. There was no seasoning or pepper type in the mixture I rubbed into the meat that would have made anything to turn color this way, so into the trash it went. A second piece of cappy went to the trash when I was trimming one end off, in preparation for vacuum-packing the product: when the knife went through, it revealed a bright orange spot on the border between the meat and the fat. Further investigation revealed that this contaminated area actually ran for quite a ways down the length of the meat. This was also not a "keeper." So we ended up losing two of ten sweet capicoli, and none of the four hot. Not a bad result, I suppose, but still bothersome. This underscores, for me, the need for a better and more controllable curing area, and it is looking more and more likely that I will be picking up a small refrigerator which can be adapted into a curing cabinet which can be used year-round not only for capicola but for other cured salumi as well. 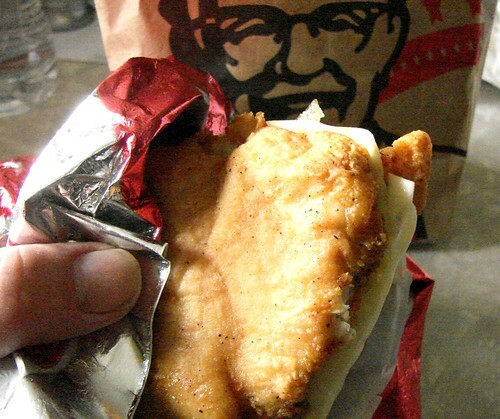 Foreground above: My delicious and awesome KFC Double Down, which I had for lunch. Background above: Colonel Harland David Sanders, looking a little pissed off, which is probably for two reasons: First, KFC turned him into a crappy-looking cartoon icon/logo with a dumbass combover and a red aprom, neither of which he had in real life. Second, he's dead and can't enjoy a Double Down. All he can do is glare at me from his brown paper bag. Tastes have changed a bit in 100 years, eh? It's hard to find sliced dried beef these days (both Hormel and Armour brands dried beef are made of "chopped and formed" beef these days, alas.) And it's hard enough to find fresh beef tongue these days without the added trouble of finding it corned. By the way, corned tongue tastes just like the best corned beef you've ever had, but with a nicer texture and quite a bit less fat. I love jerk chicken. I usually make it at home with some chicken breast that I fry up with onions all coated in jerk seasoning and serve with rice. Real jerk chicken? Probably not. Delicious with a spicy Caribbean kick? Most definitely. More than I like the spice of Caribbean seasonings, though, I loive the flavor they give things. Spicy and savory with a kick of sweet, it's always been like a carnival for my mouth. So I had picked up this Healthy Coice meal with the expectation of the same jerk flavor that I already knew I liked. I can't say that I'm disappointed with this meal. It's strongly flavored - one could almost say that it's overseasoned - with allspice, black and red pepper, and cardamom as the leading notes. Unfortunately for me, it was more of a 'mild' than a 'spicy,' but it was still extremely enjoyable. 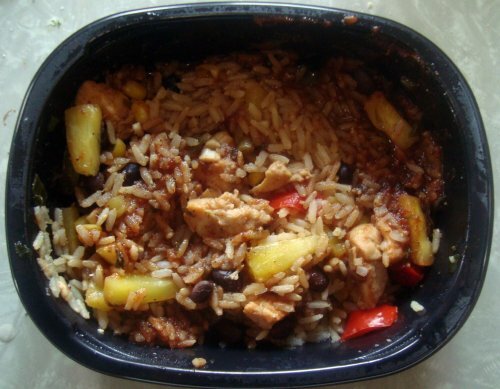 It's mostly a rice and black bean concoction, with corn and the chicken added in on top, as well as chunks of pineapple to give it a sweet, fruity kick that works well with the other sweet-tasting spices. 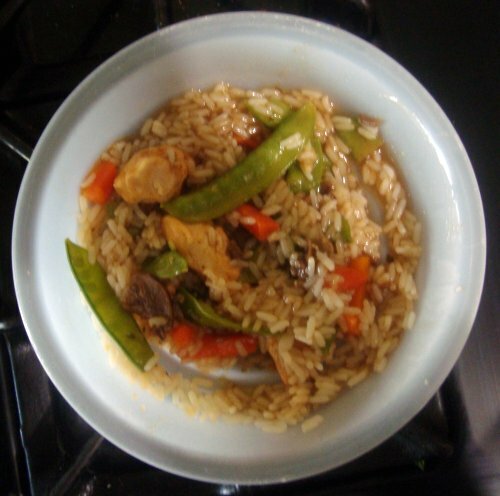 The rice was kind of strange - a bit spongy - but wasn't over or undercooked, and the chicken was tender, juicy, and held the brunt of the spices, like it had been rubbed before cooking. Delicious. I'd get this meal again if it was on sale, definitely. With a good mix of pretty authentic spices, Healthy Choice does jerk seasoning some justice...in a healthy way. 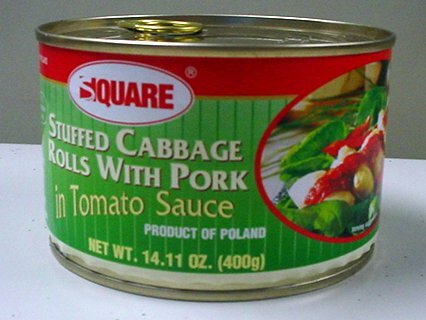 I'm fascinated by the way tinned meat products look fresh out of their shiny steel and aluminum cocoons, which is one reason why, when I review a canned meat, I always try to include a photo of it immediately after being decanted. This is corned beef hash. I don't remember the brand (it's not Mary Kitchen, it's a cheaper "house brand," but I can't recall which one.) Look at that jacket of creamy white fat surrounding the hash. It looks almost like fondant. Très magnifique, non? So, a couple weeks ago the family and I were moseying through the local Price Chopper, and Lynnafred stops short at one of the endcap displays to gaze at some shiny mylar-packaged meat product: Perky Jerky. "Whoa," she said, "Caffienated beef jerky. How bitchin' is that??" I agreed it was pretty bitchin', and into the shopping cart it went. Fast forward a couple of weeks, and I'm rummaging around in the kitchen, looking for a quick snack after work, so I opened the breadbox to see what kinds of beef jerky might be on hand, and LO! Perky Jerky is there awaiting me! Lynnafred and I both had a couple of pieces. First off, it's real sliced beef and not that chopped-and-formed crap that seems to be taking over the market lately. And you know what? Perky Jerky had damned well better be sliced beef for the price you pay. $4.99 for two ounces. Damn. That same $4.99 will get you four ounces of most other jerkies, so this is some expensive stuff. The flavor, I must admit, is decent. Moist (Lynn said "sticky") and reasonably tender, it's got the usual jerky saltiness and a bit of a peppery profile as well, though not too spicy. And don't buy it for the guarana "flavor," either, because you rally can't taste it (no surprise there, there's more soy sauce, brown sugar, and lemon juice in the stuff than there is guarana. And there sure as hell isn't that much caffeination, either. You know how most caffeinated stuff which is sold as a "pick-me-up" almost brags on the label about how much caffeine you're getting? Perky Jerky doesn't. In fact, they don't disclose the caffeine level anywhere - not on the package, not on their website. They can quack all they want about coffee being "so 2009," but a package of Perky Jerky isn't going to do the job of a good old fashioned cup of joe or can of Monster. 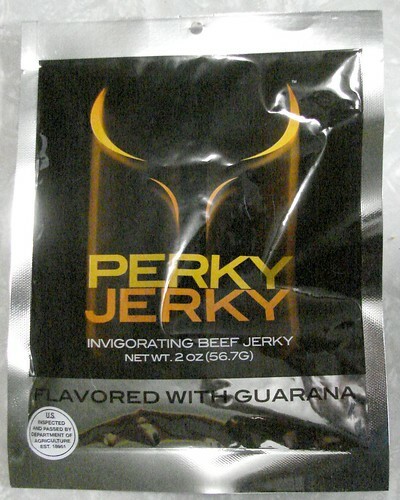 My personal opinion is that Perky Jerky is a decent quality beef jerky, cleverly marketed in order to be priced at double the going rate for all other decent quality beef jerky brands. By the way...we really do keep beef jerky (and various other snacks) in the breadbox. 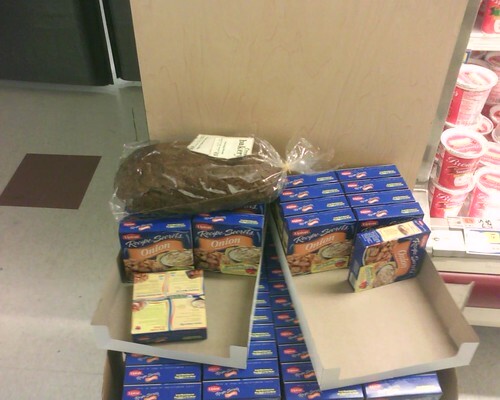 And before you ask, we keep the bread on the countertop. Another review of Perky Jerky by my fellow blogger Mr. Dave over at The Ridiculous Food Society of Upstate New York. Yet another instance of synchronicity between his blog and mine. Someday I'm going to hunt him down and buy him a beer or three. 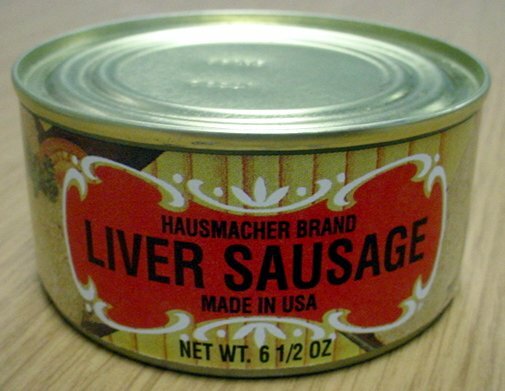 I buy canned meats and pates and stuff like that all the time, so when I saw a handful of these Geier’s Hausmacher Liver Sausage cans on the shelf during Shaw’s final hours of business, I was immediately interested. It wasn’t just the deeply discounted going-out-of-business price, either. There was something about the retro-style label and plump golden can promising pork-livery goodness that called out to me. This is what it looked like, tipped out onto a plate. 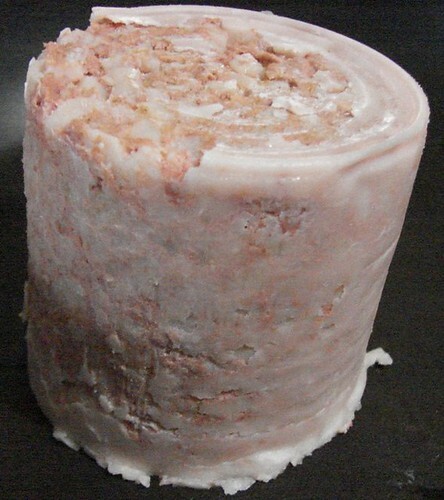 If you’ve never seen what canned pate looks like, feel free to be horrified. The stuff virtually never looks very attractive right out of the container; luckily, the looks don’t have anything to do with the taste. And that taste is…delicious! 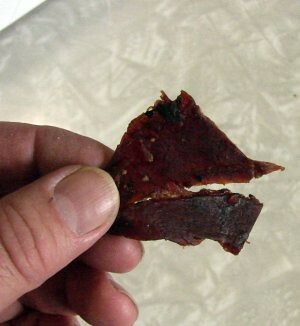 The taste is big and bold, a nice blend of assertive pork liver and meaty pig bits. The relatively coarse grind lends an interesting texture as well. Accompanied by toasted pumpernickel bread, thin slices of onion, coarse German mustard, and freshly-grated horseradish, the liver sausage made an awesome lunch. Much like the Brunswick Kippered Herring that I reviewed a couple of years ago, these delicious boneless herring fillets are carefully packaged and perfectly seasoned. The tomato and basil sauce added a very nice flavor without being overwhelming. So far, I haven't had any unpleasant surprises from Brunswick. Very nice indeed. 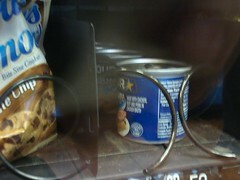 It was the last one left on the shelf. Years ago – early 1990’s, so we’re talking almost twenty years gone – I used to kind of like SPAM, served in certain contexts. It was pretty decent, for example, cut into slices and fried for breakfast alongside eggs. And it was okay for omelets: cut it up into little cubes and sizzle the bits with onion and green pepper, and then use it for the omelet filling. And then something happened. I never saw any announcement, or news item, or note on the web, but it seems to me that Hormel changed the recipe for SPAM. It seemed to taste different than it used to - a bit fattier, maybe? - and I kind of grew away from it. And Hormel started introducing a whole bunch of new varieties. 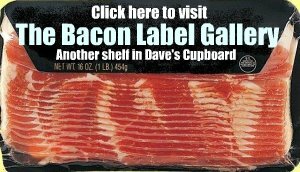 SPAM with bacon. Hickory smoked SPAM. SPAM with garlic. SPAM Lite. Turkey SPAM, for cryin’ out loud. 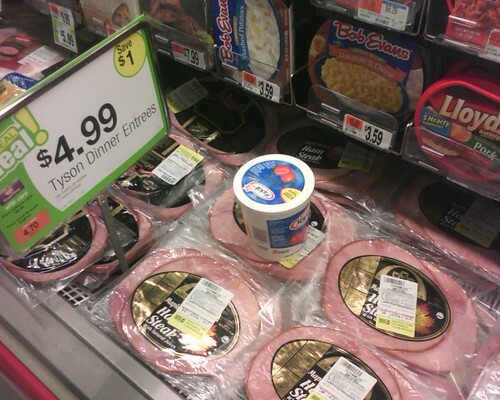 Single-Serving SPAM. 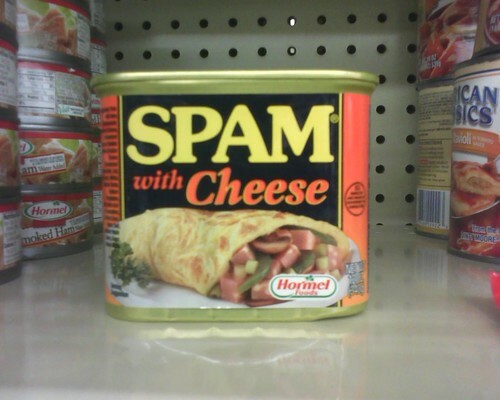 And this stuff: SPAM with cheese. No, I didn’t buy it. But if anyone out there has tried it, leave me a comment and let me know what you think of it. Saturday afternoon was unusually busy at Stop and Shop here in town. I'm guessing that Stop & Shop has picked up a lot of former Shaw's customers - especially shoppers who don't want to go to the local Big Y because that's the most expensive market in town. Whatever the reason, Stop & Shop was jammed, and as we strolled through picking up a few things, we noticed an unusually large number of items abandoned here and there througout the store. It's common for people to change their minds about purchasing stuff, and when they do they seem to just stick it on the shelf anywhere. There were so many of them this time, though, that I started snapping pictures of them as we walked along. wanted to chill with the hams. 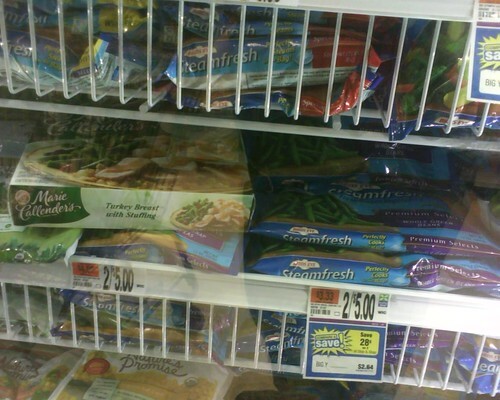 Sesame Noodles abandoned in the refrigerated section with the chicken pot pies. 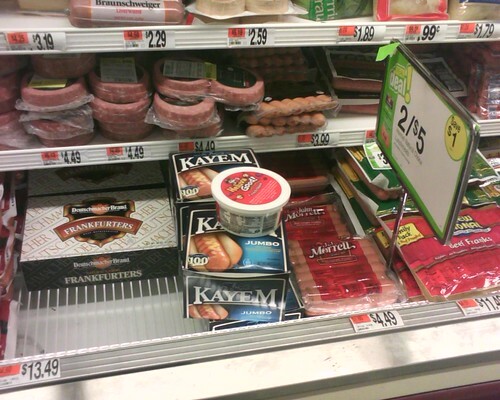 Naughty little Helluvagood Dip, wandering amongst the wieners. 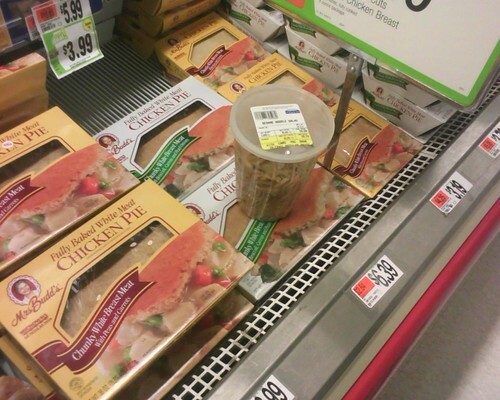 off by the same person who left the Sesame Noodles in the pot pies? to purchase. 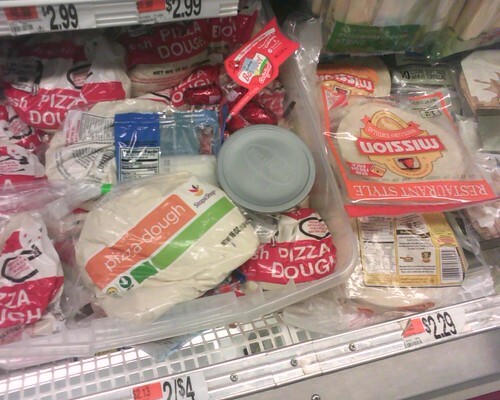 Someone dropped off a package of the more-expensive Stop & Shop brand dough. cheese rounds from near the deli. place to drop off unwanted loaves of rye bread. 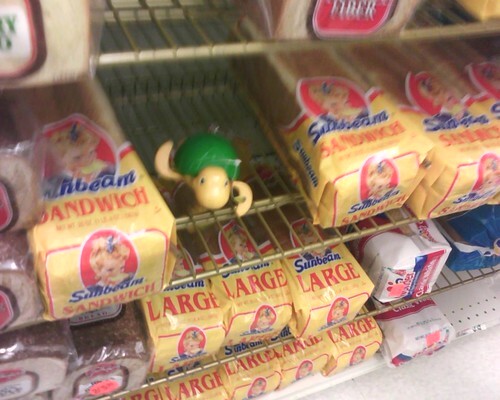 A kid's toy, nestled in with the bread. 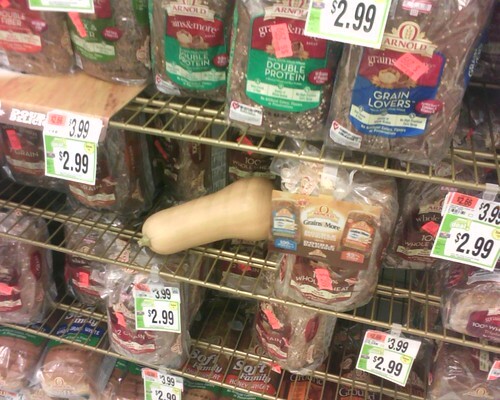 Butternut squash peeks out from the bread section. Marie Callender's Turkey Breast With Stuffing was left behind in the veggie section. 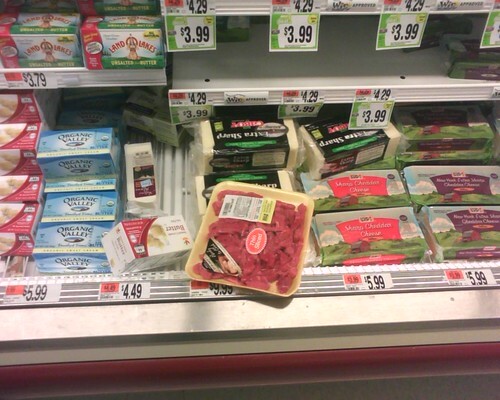 At least the moron was considerate enough to keep it in the freezer. Vintage Sunday ventures out of the pantry and into the laundry room today. Before the days of Shout! 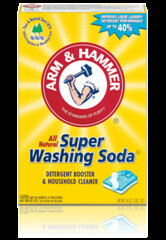 stain removers and Oxi-Clean, there was Arm & Hammer Sal Soda, or sodium carbonate. Added to a load of laundry, sodium carbonate acts as a water softener, making detergents more effective, and it helps remove grease, alcohol, and oil stains. 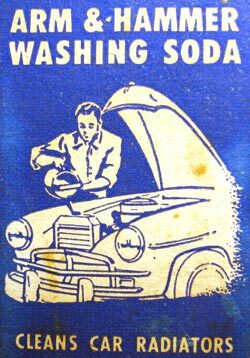 These days, Arm & Hammer markets it as "Washing Soda" and you can find it for sale alongside the detergents and such at the supermarket. Back in the late 1940's and early '50's, they called in "Sal Soda." I found an old late-40's box of it in a forgotten corner of our pantry when we moved into our current house. 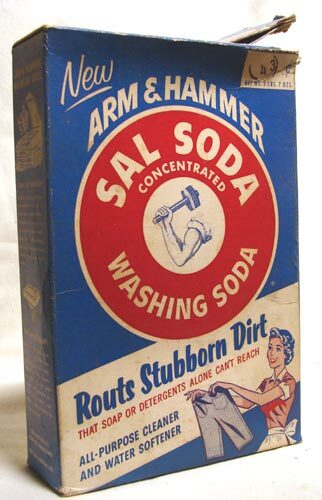 Sal Soda is still sold today - these days Arm & Hammer calls it "Super Washing Soda." It's the exact same product, but with graphics that are far less cool than the original.